EPA’s determination means a lot less virgin refrigerant will be available. But nobody knows how much R-22 has been stockpiled, or what will happen to pricing. There is going to be less R-22 than there could have been. In fact, the EPA is allowing only half as much R-22 as it could have allowed in 2015 and then decreasing linearly the amount it will allow every year from that lower start­ing point. Evidently, the EPA feels that there is too much R-22 on the market. In order for the R-22 phaseout to work the way it should in theory, the price of virgin R-22 needs to start rising. Those with equipment that leaks a lot of R-22 will find it cheaper to retrofit that equipment to use a different refrigerant, or to replace the old equipment with new. Those with R-22 equipment that is leak-free can con­tinue to use R-22 into eternity, as long as that equipment stays leak-free. People who don’t have to purchase R-22 for leak replacement don’t care how high the price goes. Until that equipment leaks, that is. What’s unknown is the amount of R-22 that commer­cial refrigeration and industrial refrigeration end-users have stockpiled. Will they keep that refrigerant for their own use, or eventually sell it back into the market after reclamation? There is no doubt that some supermarket companies have a lot of R-22 stockpiled. The EPA doesn’t know how much. The EPA has a general idea of how much is in banks with reclaimers, and they have information on how much has been sent to reclaim-ers over the past years, but they don’t have much of an idea of how much unreclaimed used refrig­erant from end-users’ own systems is being stored out there. Short of commanding every commercial and industrial R-22 end-user to provide data on the amount of R-22 they are stockpiling, the EPA has no way of figuring out that number. And that number is the key to the R-22 phaseout working the way it’s supposed to. The EPA asked some supermarkets to voluntarily divulge how much they were storing, but who knows whether supermarkets told the truth, and who knows whether those supermarkets were representative of the industry. If you knew that EPA was asking you to tell them how much R-22 you had, so that they could accurately cut R-22 production to force prices higher, would you be open and honest with that information? Imagine a scenario where R-22 prices go up, and then down again a few months later because a few supermar­kets have each reclaimed and sold 30,000 pounds of R-22 into the market. And then the price goes up again, and then it goes down again. A market like that would be very volatile, with end-users having no clue whether to buy or sell refrigerant at any point in time. I have no idea whether that is going to happen. But if I expected to still be an R-22 end-user over the next few years, I’d certainly be sure that I had my own stockpile that met all of my own R-22 needs. That way, I’d be able to thumb my nose at anything that happens with R-22 availability and pricing in the future. At least I’d have certainty. And that is worth a whole lot. Those who pay attention to the goings-on at the Environmental Protection Agency (EPA) have probably noticed the recent proposal by the Significant New Alternatives Policy (SNAP) program to make it illegal to use certain HFC (hydrofluorocarbon) refrigerants that are potent global warming gases in new commercial refrigeration equipment and retrofits as of January 2016. Manufacturers of equipment that uses natural refrigerants may be wondering if this EPA proposal represents an opportunity for them. The answer to that question is a definite “maybe,” depending on the type of commercial equipment they manufacture and where they are in the development process. Manufacturers of commercial refrigeration systems or the components used in these systems are unlikely to feel a direct effect from the proposal. There are still plenty of HFC refrigerants available for commercial systems, such as R-407A and R-407F, so systems manufacturers are not (yet) being forced into natural refrigerants. Manufacturers may see an indirect effect, however, because even though the proposed rule doesn’t directly dictate that end-users must use natural refrigerants, end- users may view it as the EPA’s first step in that direction and interpret this proposal as a not-so-gentle electric shot to their derrières. Many supermarket end-users have already been investigating natural refrigerant commercial equipment, perhaps even trying them out in a store or two. When asked by their colleagues why they install these systems even though they are currently more expensive than traditional systems, they usually respond that they think it is important to get out in front of the EPA, so that they are ready when the agency starts to phase down or eliminate HFCs. They want to start evaluating natural refrigerant systems at their own pace and influence the designs where necessary to make the technologies work for them. They realize that the first natural refrigerant system they install may not be the cheapest one available, but they are banking on the fact that they’ll work out the kinks and get to the point where these systems make financial sense. They think that starting with natural refrigerant systems now will give them a competitive advantage later when everyone else is forced to make the switch on the government’s timetable. The equipment manufacturers now working with these end-users will be ahead of the game when natural refrigerants become mainstream. They will have benefited from the expert input from end-users at all stages of the design phase, as well as from valuable feedback from end-users and service technicians on improvements in the ease and cost of installation. They will have gathered proof that natural refrigerant systems reduce costs through energy efficiency gains, decreased line sizes for piping, etc. Most of the major systems manufacturers saw the writing on the wall that the EPA was going to start to move the market in the direction of lower-GWP (global warming potential) refrigerants. The EPA has not made a secret of its desire to combat global warming, and it hasn’t minced words about refrigerants being one of the opportunities to quickly make major greenhouse gas cuts. The agency has attempted for the past several years to get the Montreal Protocol to act against HFC refrigerants. They have started an international organization called the Climate and Clean Air Coalition with more than 80 partners around the globe to address HFCs and other potent global warming gases. The EPA’s Green Chill Partnership has been consistently preaching that supermarkets should be using the lowest GWP refrigerant that meets their performance needs. EPA plenary presentations at the Food Marketing Institute’s annual Energy and Store Development Conference have focused on the list of power GWP refrigerants that are available for commercial refrigeration and presented the history of refrigerant use as a series of moves over decades that will eventually lead to the use of very low GWP refrigerants (see diagram). The EPA has held numerous webinars on lower GWP refrigerants that are available for commercial refrigeration and focused on CO2 systems, ammonia systems, and hydrocarbons, which are already in use in U.S. supermarkets. The manufacturers that did not see this coming have not been paying attention. Take the manufacturers of self-contained commercial refrigeration units as an example. Many of them testified at an EPA hearing in August on the proposed delisting rule that they need more time to convert their equipment to use lower GWP refrigerants. There is no doubt that their R&D process will take several years, as will line conversion at manufacturing facilities and the process to get new equipment tested for safety and certified by a Nationally Recognized Testing Laboratory. That’s not to say that there aren’t plenty of self-contained equipment companies that saw that the EPA was going to move in this direction. There are several that are ready to supply the market demand for self-contained refrigeration units that use hydrocarbon and CO2. They are ready for January 2016, and they definitely have a competitive advantage over companies that lag behind them. But isn’t that as it should be in our system that thrives on innovation, smart decisions, and visionary leadership? Should the EPA give more time to companies that failed to see or ignored what was coming? Or is this natural selection at work in our capitalist marketplace? Yes, the free market is cruel. Survival of the fittest makes easy prey of those who don’t change with the times. Whether the EPA gives more time to self-contained equipment manufacturers that lag behind will depend in part on whether companies that already have this equipment will be able to supply 100% of the demand for that equipment as of January 1st, 2016. If they can’t meet the demand, or if there are too few manufacturers to provide healthy competition, the EPA will likely give others a few years to develop their capabilities. Even if self-contained commercial equipment manufacturers are given more time to bring low GWP refrigerant equipment to market, companies that are ready now will still have an advantage. End-users don’t want to wait until regulations go into effect to start trying out new equipment. They want to figure out whether units that use hydrocarbons or CO2 save energy, whether size requirements will change, even whether it is possible to use self-contained units to refrigerate all the food in small footprint stores. They want equipment now. Companies that stop everything to try to fit a lot of R&D and manufacturing changes into a few years will also suffer from the disruption to their business caused by having to focus all their human resources, time, and financial resources to make this switch as soon as possible. During this time, they won’t have any people, energy, or money to focus on much else. In the meantime, companies that are ready now can focus on next-generation technology over the next five years to remain ahead of everyone else. And that may be as it should be. What Is Your Used R-22 Worth? About five years ago at the FMI Energy Conference, I gave a plenary presenta­tion on the EPA’s R-22 phaseout. I posed a question to the audience: Why were supermar­kets paying people to come and haul away their used R-22? I commented, admittedly somewhat facetiously, that paying someone to come and take away your used R-22 after a refrigerant ret­rofit was like finding a suitcase full of money bur­ied in your basement and paying a junk collector to come and haul it away for you. I was confronted by several reclaimers after the presentation who told me that my analogy was ex­tremely flawed. The money in the suitcase would have to be so dirty that it couldn’t be used unless it was cleaned and made like new. They assured me that I’d gladly pay someone to haul away money that was covered in mud and grease. The conversation then deteriorated into jokes about money laundering, and, as is often the case at the FMI Energy Conference, the conversation resulted in more questions than answers. Over the past five years, supermarket industry prac­tices with respect to used R-22 have certainly changed. Most recognize now that the value of a pound of used R-22 is about equal to the price you’d pay to pur­chase a pound of new R-22. The common practice is to recycle the used R-22 in-house by running it through a filter drier and storing it for use in the company’s other R-22 systems. 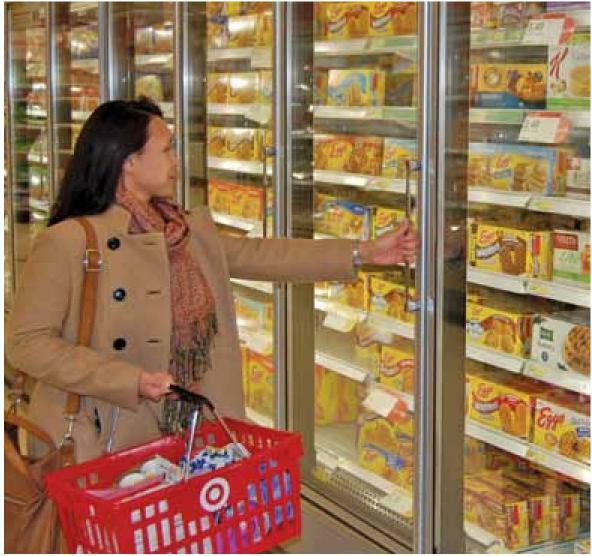 Supermarkets save money by not having to purchase as much new R-22, but they also protect them­selves by hedging against future price increases and/or R-22 shortages as the R-22 phaseout progresses to its end stage in 2020. I know of companies that have not had to purchase R-22 for the past three years because they have their own stockpiles. They watched the R-22 prices rise and fall over the past few years with big smiles on their faces. They aren’t worried about possible price increases when the EPA cuts production of R-22 again next year. Year after year, these companies need less and less R-22, while building up more and more of a reserve. Imagine not hav­ing to worry at all, ever again, about the R-22 phaseout. Companies do face some challenges in managing these R-22 reserves. How do you transport the R-22 between stores? Where do you store it until it’s needed? Who keeps track of all that R-22? How do you make sure that your refriger­ant doesn’t fall off the back of a truck at some point, especially as the price of R-22 goes up? Finally, how much time do you want your refrigera­tion team to spend on your R-22 stockpile, instead of keeping your display cases cold? All of these issues are manageable, as demonstrated by the numerous companies that have successfully ex­ecuted their plan for used R-22 over the past few years. If a company does 10 R-22 retrofits in a year, pulling out about 3,000 pounds from each of those 10 systems, the company has a stockpile of about 30,000 pounds of R-22. If R-22 costs $10 per pound, you’ve got an asset of about $300,000. Remember that this $300,000 would other­wise be a cost to the company as it purchases new R-22 for its systems. If you take the standard assumption of a 1% profit margin for a super­market, a company has to sell about $30 million worth of goods to earn $300,000. I have yet to run into a com­pany that can’t find or hire someone to manage an asset of this size. I’d do it. And believe me, if I found a suitcase full of that much money in my basement, I’d find a way to clean the mud and grease off it, too. What’s legal, and what’s not, under EPA’s proposed new rule? Will 134a be banned? Do you have to use natural refrigerants as of 2016? Here are the answers — well, at least some of them. A few weeks ago, the EPA pro­posed a new rule that would make it illegal as of 2016 to use R-404A and R-507A in new commercial refrig­eration systems and retrofits. The rationale behind this proposal is that there are numerous other HFCs that can be used, all of which have less global warming impact. These HFCs, like 407A, 407F, and 134a are readily available, and their use instead of 404 and 507 is a no-brainer. Or so I thought. I have been inundated with calls ever since the EPA issued its proposal. Most of the calls focus on the confusion generated by the wording of the proposal and the errone-ous belief that 134a would not be allowed in commercial systems as of 2016. That is easy enough to clear up. As of 2016, you may use 134a; in fact, of all the HFCs that may be used, 134a is one of the best choices from the perspec­tive of just the global warming potential of the refrigerant. You may also choose any number of natural refriger­ants for new systems. Though the natural refrigerant choices for R-22 retrofits are not yet well developed, retrofits that convert R-22 equipment into a CO2 cascade system with just small amounts of 134a or a 407 as the primary refrigerant have been carried out successfully. Some of the other calls are more troubling. I’ve heard from supermarkets that have been scared by chemical manufacturers into thinking that this rule means you must use a natural refrigerant in commercial refrigera­tion systems as of 2016. I’ve heard that it is impossible for supermarkets to make this switch. I’ve heard that various equipment manufacturers would face incredible hard­ships to change their manufacturing processes to comply with this mandate. I’ve heard that service techs cannot deal with this change. I’ve heard that this is just another attempt to kill American businesses. First of all, if you are in this industry and you did not suspect that this was coming, you haven’t been paying attention. With regards to the misinformation that might or might not be coming from very knowledgeable and informed industry stakeholders, I can only assume it is based on innocent misunderstandings. If you rely on peo­ple other than the EPA to explain EPA proposals, rules, and such, please be sure that these people have their facts straight. Try to find a source of information that does not have an economic interest in your decisions. The best source of info about EPA proposals and regulations is the EPA. I know it can seem scary to voluntarily call the EPA and ask questions, but I can assure you that many who work there are very eager to explain things to you. Really. I promise. The point about this switch from 404 and 507 being impossible for supermarkets, systems manufacturers, and service techs is contradicted by the number of supermar­kets that switched years ago to lower GWP alternatives for new systems and retrofits. In fact, supermarkets led the charge toward lower GWP HFCs in 2009 and 2010. An added benefit of that decision was that retrofit­ting existing systems from R-22 to R-407A reduced the amount of work needed by the refrigeration contractor and reduced the cost of conversions per system. Among the many other companies that have already moved away from 404 and 507 for new systems and retrofits are Walmart, Target, Whole Foods, Sprouts, Supervalu, Pub-lix and Weis Markets. The general consensus seems to be that there is little downside to switching to lower GWP HFCs, and the environmental benefits of the switch are a major upside. These numbers are backed up by information from major commercial refrigeration service contractors. Sean Patrick, director of field operations at The AMS Group, states that “to date, 100% of our conver­sions have been to a 407 variant.” He agrees with others that occasionally there may be capac­ity constraints for R-22 retrofits to sys­tems where capacity is tight, but these situations are rare. Bill Almquist, president and CEO at Almcoe Refrigera­tion, mentions that the climate impact of the increased energy consumption of some of the lower GWP refrigerants has to be counted against the climate benefits of the refrigerants themselves. What about the final issue: that EPA is out to destroy American business? I could write an entire article about this. At some point in time, I’m sure I will do that. For now, I’ll just say that this seems to be a question that is both asked and answered based on one’s politics, rather than facts. Whether you believe that EPA should be done away with or you think that EPA doesn’t do nearly enough to protect the environment, I doubt that anything I can write will change your mind. I’m a pretty practical person. I try to concen­trate on areas where I can be of help. What I am going to focus on in relation to EPA’s proposed rule are the questions that I think are the ones we should be asking. GOOD QUESTIONS What is the definition of a “new” system? If you double the size of your store during a remodel and you double the size of your refrigeration system, can you add new 404A racks onto an ex­isting 404A system? Or does EPA consider the whole system now to be a “new” system, due to the “new” racks being added to the “exist­ing” racks? 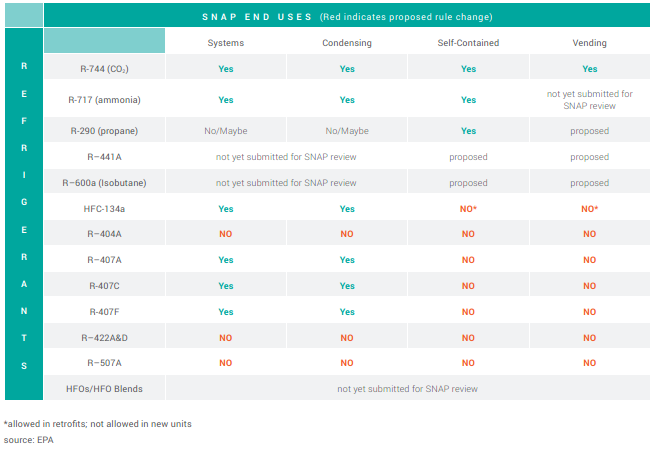 Is the EPA going to propose a phaseout of the use of 404A and 507 in existing systems at a later date, only to have us go through yet another series of retrofits? Is the EPA going to restrict the supply of 404 or 507, so that the prices of these refrigerants increase enough that no one can afford to buy it for existing systems? Is the EPA going to wait a few years and then restrict the use of 407 refrigerants and/or 134a? And finally, are we ever going to find a solution to the environmental harm caused by refrigerants, so that it’s not necessary for EPA to regulate them anymore? So much attention is paid to all kinds of technologies to extend the shelf life of refrigerated food, with fancy supply chain efficiencies, inventory forecasting, and the like. Then you find out that, at the end of this entire process, stores restock their frozen food cases by bringing out 10 pallets at once and letting them sit out in the open for hours while the re-stocker moves from palette to palette and case to case. In the meantime, several hours have gone by with all that food sitting at room temperature. I am puzzled by this type of headline. Of course banning HFCs as of any point in time will make a big climate impact. They give numbers of what would be achieved if HFCs were banned in 2020 … well guess what? If you ban them in 2019, it will have even MORE of a climate impact. If you ban them today, you’ll have the GREATEST POSSIBLE climate impact! And if we ban cars as of today, guess how many metric tons of CO2 we can avoid? If you reduce pollution, pollution levels go down. Wow. I don’t know anyone who wants to hold on to high GWP HFCs just because they are enamored with them. We have seen in the US supermarket industry that if lower GWP options are available that perform the same function as the high GWP HFCs, people will switch to them. Voluntarily!! Instead of talking about the great environmental benefits that can be achieved if we ban HFCs, I’d like to see more time and energy spent in figuring out how to come up with low GWP alternatives to HFCs in areas where they do not yet exist. Even better, because we know that we can get to 90% natural today, in new stores and in existing stores, why not work on figuring out how to make that happen? There is zero percent chance that HFCs will be banned world-wide by 2020. There IS a chance that we can be 90% there. I tend to look at these topics from a realistic perspective and a practical point of view. 90% now? Or a lot of talk about what could be achieved in a situation that has no chance of becoming reality and no action?